ARTafterDARK is the Honolulu Academy of Arts' monthly art party organized by a dynamic group of young volunteers dedicated to exploring the arts. 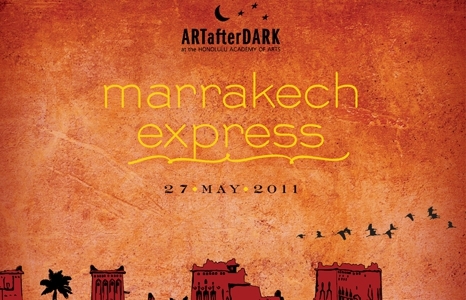 Journey to the Maghreb on the Marrakech Express. DJ Nocturna sets a Middle Eastern tone. Central Courtyard, 6-9pm. Phoenix Dance Project belly dancers will perform in Central, Kinau, and Banyan Courtyards, 7-9pm. The Souk in Banyan Courtyard features Chai Studio, Kai Spices, India Market, Whole Foods Kahala, and the Doris Duke Foundation for Islamic Art. Come participate in Orvis artist-in-residence James Jack's installation by sculpting a cone that will become part of the site-determined work "Miniature Landscape for O'ahu." For this night, it'll be "Miniature Landscape of the Moroccan Desert" in Kinau Courtyard, 6-9pm. New York-based artist Darren Waterston gives a gallery talk for his new exhibition Forest Eater. Meet in front of Gallery 29 (upstairs in Luce Pavilion) at 6:45pm to start the tour. Take a special tour of the Arts of the Islamic World Gallery (26) with an Academy docent. Meet inside the gallery by the Banyan Courtyard entrance. 7pm & 7:30pm. Participate in our ?art gallery hunt to win a private tour of Shangri La for you and 3 friends! Get your forms in Central Courtyard, fill out the gallery questions, and submit your answers. Still not a member? Well here's something to sweeten the pot—sign up for a new membership at the Individual level in front of the Academy that night and you'll be entered to win another private tour of Shangri La for four people. As a new member, you'll be able to pass the long lines and get your special wristband for the members-only bar in Mediterranean Courtyard. 2) FREE: Street parking on Beretania and Kinau Street from 6 p.m.
4) $5 at the First United Methodist Church Parking Lot on the corner of Beretania and Victoria streets. NOTE: lot closes promptly at 10 p.m.